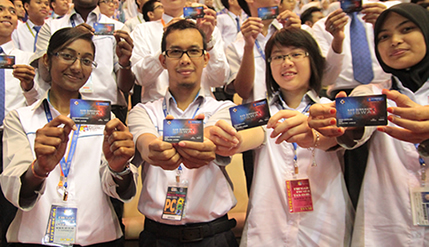 BANGI, 7 Sept 2012 – Full-time Malaysians students in any of the country’s universities, public or private, are being given discount cards for their use to help ease their financial burden while studying. Minister Mentor of The National University of Malaysia (UKM), Dato ‘Sri Liow Tiong Lai, a UKM alumni, said all undergraduates are eligible to get the special discount cards. 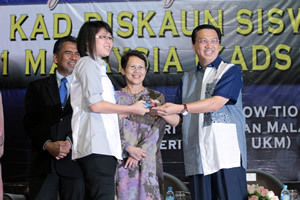 Speaking at a presentation ceremony of the cards to the new UKM intake here today, Dato ‘Sri Liow who is the Minister of Health said the Government is sensitive to the needs of the public, including freshmen entering university for the current 2012-2013 session. He said the government will ensure that all students can benefit from the use of the facility but reminded them not to waste their money just because they have the discount card. The cards were presented to representatives of the new undergraduates according to their residential colleges by UKM Vice Chancellor, Professor Tan Sri Dato’ Wira Dr Sharifah Hapsah Syed Hasan Shahabudin after their oath-taking ceremony today. 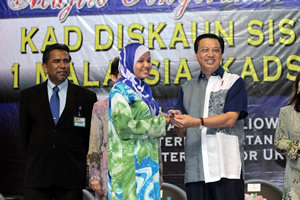 Dato’ Sri Liow reminded the new students not to overspend merely because they have the discount card. It was given out to the students to help them reduce expenditure, so that they can then concentrate on their studies. The cards called KadDiskaun 1Malaysia or KADS1M, is the brain-child of the Domestic Trade, Cooperatives and Consumerism Ministry. The goal is to help reduce the cost of living of students in public and private institutions of higher learning nationwide. KADS1M cards are given free to long-term students of at least one year duration. They must also be full-time students and are citizens of Malaysia. Dato’ Sri Liow said to date 206 companies are taking part in the KADS1M programme giving a discount of between 2% to 60% for selected goods and services subject to the rates, terms and conditions specified by the participants. KADS1M is a swipe card and doesn’t offer reward points to users. Students only need to show their KADS1M cards along with their student matriculation card or MyKad to enjoy the discount.